I travelled to the 2014 Peace Cup final with a few of the guys I play Sunday football with. 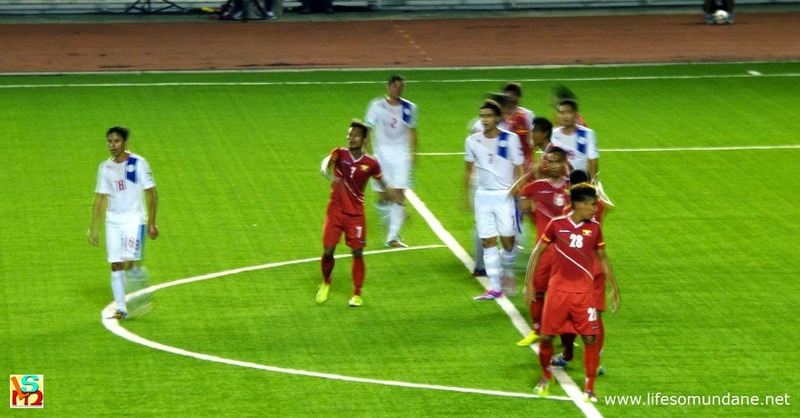 Good experience, especially for the younger lads who were watching the Azkals for the first time; but bad result. There were one or two complaints about the weather. No it was fine! But I had asked all of them to purchase raincoats just in case. Since when has weather ever been predictable? At any rate, here are a few notes about the match. No, it was not bad at all! Although, in typical Pinoy fashion, Rizal Memorial started to fill up after the game had started. Nothing like the World Cup qualifiers when even the bleachers behind the goals were occupied; but a decent-sized football crowd nonetheless. Certainly a big improvement to when I played NCAA football for my university back in the late seventies and early eighties when typical attendance would be less than fifty people and some stray cats. Of course, we all know that Myanmar are now coached by Radojko Avramović, who steered Singapore to four Southeast Asian titles, including the last Suzuki Cup. The defensive organisation was already evident; not to mention that nastiness I was talking about. We sat next to a pitiable group of Myanmar supporters; and the humour in the stands reminded me of why I used to love attending NCAA basketball matches when I was in college. The group from Myanmar was careful not to call a lot of attention to themselves, but naturally. When they did speculatively start chanting “Myanmar!” the Filipinos surrounding them would respond by chanting back “Philippines!” Each time, the exchanges would be followed by good-humoured laughter and equally good-humoured applause by both groups. In the stands, it was very much the Peace Cup. On the pitch, it was not. I was very much reminded of how the high school boys that I used to coach would describe that state of officiating in the school league where we used to play: no blood, no foul. Some of the two-footed, studs-showing sliding tackles – and even by our own boys – were making me cringe inside. In the BPL, these would be certifiably red. As one of the guys I watched the game with laconically remarked in response to one such crude tackle, “Seminar!” What he meant was that the referee badly needed a refresher course. One decision early in the match soon after Myanmar had scored when he allowed the Philippines to restart the game when Myanmar were still celebrating their goal was totally mystifying. Perhaps technically, because all the Myanmar players were back inside their own half, he was correct to allow the game to be restarted. But then, hello! Has sportsmanship become completely unfashionable? One can argue that the Philippines were clever when they restarted the game. On the other hand, on the two occasions that we scored, those around me were screaming at the Azkals to forget their celebrations and goddamned get back to their positions! What annoyed me the most about the referee, however, was that he never got a grip on the match. By failing to protect the players – of both sides – he basically killed the flow of the game. Because he failed to stamp his authority upon the match early on, the match was plagued by frequent interruptions as both sets of players became testier and testier. In fairness to the Azkals, Myanmar started it. But apparently, that Burmese player had more to him than I was prepared to give him credit for. Either that or a sudden gust of wind blew the ball down into goal behind the embarrassed Müller. The second was even worse and it happened right in front of where we sat. Under Michael Weiss, I thought Misagh Bahadoran was more form than substance. Thomas Dooley was starting to make a believer out of me because suddenly, Bahadoran does not play like a headless chicken anymore. To be fair, Bahadoran was playing reasonably well against Myanmar, all things considered. However, the foul he conceded when the game was practically won was so totally unnecessary. I mean, have we not all learned yet from the Challenge Cup final – no less – not to concede freekicks in dangerous positions? It would have been a simple matter of containing Myanmar in the corner because the outstanding Daisuke Sato was in position, anyway, to prevent a cross. We had two or three chances, I think, to put the ball away before Myanmar scored the winner; but it is difficult to really take issue with this because it was extra time on a sultry evening at the Rizal Memorial. I would not trade places with any of our defenders. Just a word about the defensive line: who was commanding it? Hard to say if Rob Gier and Simone Rota were talking to each other from where we sat. However, I was watching the defensive line when it was in front of us and I did not think the two were on the same page. The young fellers I watched the game with, all schooled in football played ‘along the carpet,’ kept screaming at the Azkals to bring the ball down whenever the Scuds were launched from deep. Somewhat reminiscent of the Weiss era, I suppose; but the long balls probably made sense given the way Myanmar played with a high defensive line and pressed high. It has to be said, too, that one such Scud enabled us to win a penalty from which Phil Younghusband would put us momentarily ahead. In truth, though, the Azkals under Weiss suffered in terms of link up play because Martin Steuble had not joined up yet. Without him we have a glut of defensive midfield players but are terribly short on the sort of players who can stitch together passes so that these become purposeful. The short passing game that we started to see once Dooley took over, in my opinion, is as much due to Dooley’s playing philosophy as it is to the availability of Steuble. Where was he, then? We all heard about the big to-do with Stephan Schröck, Dennis Cagara and to a certain extent, Neil Etheridge. Unless I missed it, there was nary a whisper about why Steuble would be missing. I did see somewhere that he had been purchased by one MLS club. Good for him, but I hope he will be released for the AFF Suzuki Cup. On the basis of Saturday night’s form, I believe we can all reasonably assume that the 2014 Suzuki Cup will not be won. Albeit, Dooley has time and the players will gain more match fitness once the new UFL season commences. In the 2012 Suzuki Cup, I thought at times against the meaner teams like Thailand that we were too ‘nice.’ I suspected that our Europe-bred players expected officiating to be of the same calibre as in Europe. In Southeast Asia, however, the interpretation of the rules can at times still be old school, so that players can still get away with a fair bit of gamesmanship. Against eventual champions Singapore, however, the Thais received as much as they got so that the latter could not employ the same bullying tactics that they used against our boys. The Singaporeans were gentlemen footballers against our Azkals in the two legs of the semi-finals because our boys have always played fair. Against the Thais, the Singaporeans showed that they could be just as nasty if not nastier. That is, without losing their heads, as we seemed to do against Myanmar last Saturday. In short, we need to develop a bit of nastiness if we are to be successful; and add mental toughness to our obvious advantage in physicality. Annoying for those of us in the stands; but effective as we all saw.